Preheat oven to 350° Season chicken breasts with salt and pepper and dredge in flour. Heat oil in skillet set over medium heat. Sauté garlic for 1 minute. Add chicken breasts and brown for 2 minutes on each side. Spread half of the can of bruschetta in an 11 x 7 inch glass baking dish. 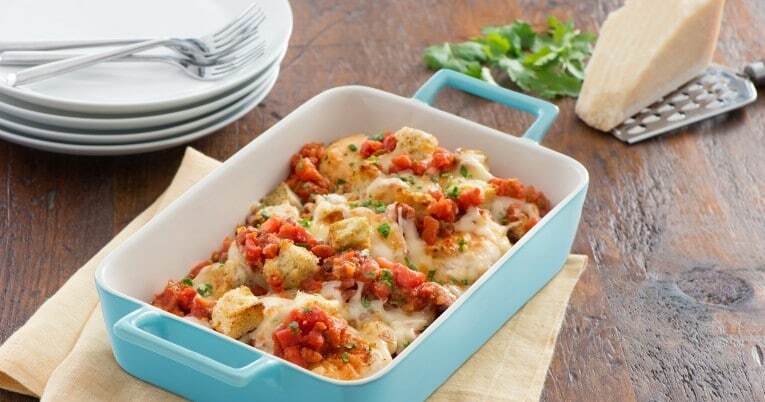 Place chicken breasts on bruschetta mixture. Spread remaining bruschetta over top. Bake for 45 to 50 minutes until chicken juices run clear when pierced with a fork. Broil on high for 1 minute until cheese is bubbly and golden brown. Sprinkle with parsley.